(Nanowerk News) Faster, smaller and more energy-efficient – that is what computers of the future should be like. A new phenomenon stands to make a major contribution in this direction: It needs 100,000 times less current than existing technologies, and the number of atoms needed for a data bit could diminish significantly. A team of physicists from the Technische Universitaet Muenchen (TUM) and the University of Cologne are driving this technology forward. They have now developed a simple electronic method for moving and reading data bits. 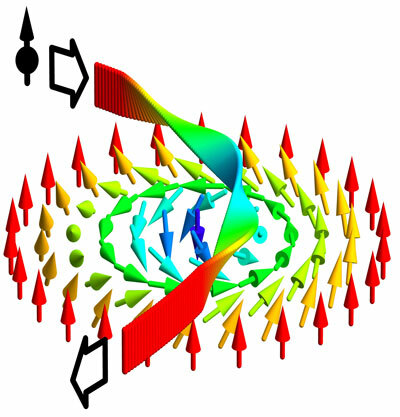 The journal Nature Physics reports on their results ("Emergent electrodynamics of skyrmions in a chiral magnet"). Three years ago Professor Christian Pfleiderer and his team from the physics department at the TUM discovered an entirely new magnetic structure in a silicon manganese crystal – a grid of magnetic eddies. Together with the team of Professor Achim Rosch from the University of Cologne, he studied the properties of these eddies, so-called skyrmions, named after the British physicist Tony Skyrme, who predicted their existence 50 years ago. They were expecting results in the field of so-called spintronics, nano-electric components that utilize not only the electric charge of electrons for processing information, but also their magnetic momentum, known as spin. While Peter Grünberg and Albert Fert received the Nobel Prize in 2007 for work on significantly faster data readout, research today concentrates on the question of how magnetic information can be written directly to materials via electric current. However, the extremely strong electric currents required produce side effects, which are practically untamable, even in nano-structures. Since skyrmions can be moved with 100,000 times less current, interest has been aroused in both the scientific community and in industry. Although magnetic eddies were discovered in silicon manganese it was clear that it would not remain the only material capable of generating skyrmions. This has turned out to be true. Meanwhile, Japanese researchers have proven that individual eddies can be generated, and a group of physicists from the Research Center Jülich, as well as the Universities of Hamburg and Kiel, provided evidence that magnetic eddies can be generated on surfaces. They managed to build a data bit out of only 15 atoms. By way of comparison, a magnetic bit on a common hard drive requires about one million atoms. Yet, writing, updating and reading out information remained a problem. So far, Professor Pfleiderer’s team has resorted to neutron radiation from the neighboring research reactor FRM II at the TU Muenchen to study the materials. “We can just take the crystals generated in our laboratory at the physics department, walk over there and use the neutrons to measure the magnetic structure, its dynamics and many other properties,” said Christian Pfleiderer. At present a current is used in the read/write head of a hard drive to generate a magnetic field in order to magnetize a spot on the hard drive and thus write a data bit. Skyrmions, in contrast, can be moved directly – and that with very small currents. “This should make saving and processing data much more compact and energy-efficient,” said Christian Pfleiderer. However, the measurement of this phenomenon still depends on very low temperatures. The European Research Council is currently funding a project with the aim of developing new materials that will permit the use of skyrmions at room temperature. But there is a lot of research work yet to be done before the first electronic components based on this technology reach the market.